IQS Directory is a top industrial directory listing of leading industrial dental ultrasonic cleaner manufacturers and suppliers. Access our comprehensive index to review and source dental ultrasonic cleaner manufacturers with preview ads and detailed product descriptions. These dental ultrasonic cleaner companies can design, engineer and manufacture dental ultrasonic cleaners to your specifications and application need. A quick and easy to use request for quote form is provided for you to contact these dental ultrasonic cleaner manufacturers and suppliers. Each company has detailed profile information, locations, phone number, website links, product videos and product information defined. Read customer reviews and product specific news articles. We are the right resource for your information requirement whether its for a manufacturer of dental ultrasonic cleaners, horizontal blind cleaners, blind cleaning equipment. 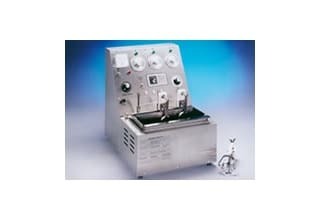 ESMA specializes in dental and medical ultrasonic cleaning equipment. Our ultrasonic solutions are uniquely formulated for the unique requirements of the dental office environment, penetrating and dispersing soils leaving a thoroughly pre-sterilized, polished instrument. Our dental tanks are non-automated and effectively clean instruments by using a unique ultrasonic rinse, hot water flush, and hot-air drying action. We produce precision ultrasonic cleaning equipment for use in the dental and pharmaceutical industries. Since 1972, we design and make everything right here in the US and are a woman owned business. We offer ultrasonic cleaners in frequencies up to 170 kHz for the highly sensitive components. Contact us for more information! Pro Ultrasonics does it all when it comes to ultrasonic cleaners. We offer a full line of standard precision cleaners for use in the dental industry, or can custom design equipment just for you. From initial design to final delivery and training, Better Engineering truly is your one-stop-shop for ultrasonic cleaning! We distribute abrasive blast equipment, standard and engineered aqueous wash systems, automated blasting system cabinets, vibratory and high energy deburring and waste water treatment services and supplies. We carry abrasive blasting media, blasting cabinets, blast and mini-blast rooms and barrel cabinets. Call us today! A dental ultrasonic cleaner is a small machine that is used to clean dentures using the high frequency waves generated by ultrasonic technology in a cleaning solution. These waves create bubbles that agitate the surface of the dentures and thoroughly clean every crack and crevice to ensure that they are cleaner than they ever would be if someone were to attempt to clean them by hand. This convenient and efficient process is especially useful for anyone who wears dentures on a daily basis and wants to be sure that they are clean before and after each use. A dental ultrasonic cleaner can also be found in a dentist’s office where dental hygienists make use of the technology to clean tools and components used in their practice. The cleaner allows them to quickly clean instruments, but a spray form of the ultrasonic cleaner can even be used to clean the teeth of patients. An ultrasonic tooth scaler emits cleaning solution that has been agitated by high frequency waves. This solution cleans the patient’s teeth when it comes into contact with them by removing any plaque or buildup that may be resting on the surface or caught in the small space between the teeth. The energy exerted by the dental ultrasonic cleaner can remove any particles that might be stuck. Water is used as a coolant so that the solution does not bother the patient’s teeth, and the experience can be much more pleasant than the traditional method of plucking away at plaque using sharp metal instruments. Many companies that manufacture large ultrasonic cleaners for industrial use also manufacture these small dental ultrasonic cleaners for sale to clients in the dental supply industry. The basic principles used in a dental ultrasonic cleaner are the same as the ones used in any custom ultrasonic cleaner. A solution that is developed specifically for use in dental applications is used with the ultrasonic cleaner. This solution is required to maintain the appropriate PH levels and protect the patient from being exposed to any harmful chemicals while his/her teeth are being cleaned. Dental Ultrasonic Cleaners - ESMA, Inc. 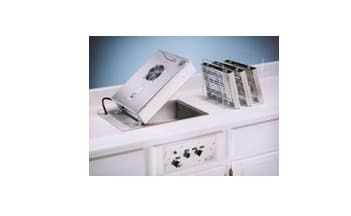 Dental Ultrasonic Washers - ESMA, Inc.